What if your timepiece boasts of being the most accurate one? We are sure you would like to join that league. By the way, Citizen is letting you do this! 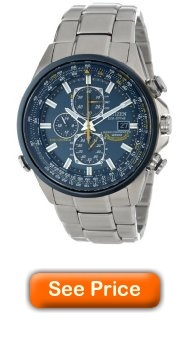 Citizen AT8020-54L is an Eco-Drive watch with atomic timekeeping, the World Chronograph A-T. The world’s most accurate watch, this perpetual calendar chronograph is radio-controlled and shows world time in 26 world cities and features a non-reflective sapphire crystal. Also available in limited editions. Production on limited edition models is limited to 2,500 pieces worldwide. Each limited edition timepiece comes in a handsome leather presentation box. Japanese quartz movement is an extremely accurate electronic movement developed in Japan that utilizes the natural frequency of vibrations of a quartz crystal to regulate the operation of the timepiece. These watches do not have the environmental impact that battery-operated watches do. If flying high was always your dream then blue angels is letting you do that! Dial with a blue base represents the big and clear sky of dreams and so many little orange colored intricate markings are to die for. The Citizen Eco-Drive Blue Angels World Chronograph A-T is a radio-controlled perpetual calendar chronograph world timer with atomic timekeeping in 5 time zones (North America, the UK, Europe, Japan and China) and automatic time in 26 world cities. Specific functions also include a 1/20 second chronograph that measures up to 60 minutes, perpetual calendar, 12/24 hour time, day-date, alarm and power reserve indicator. This handsome timepiece in stainless steel with blue ion plated bezel features a non-reflective sapphire crystal as well. Named for the elite flight squadron of the U.S. Navy, this Blue Angels Citizen watch is as graceful and accurate as the group’s piloted precision, with their official insignia appearing on the case back of this 200 meter water resistant watch. Citizen Eco-Drive is fueled by light, any light, so it never needs a battery. The stainless steel bracelet has fold over clasp with hidden double push button. The three chain pattern is build up with bold and big blocks which mark the masculinity and sportiness which this watch has got. Full list of awesome features here! Combined with atomic timekeeping, it is the most accurate watch in the world. What else do somebody need? Accuracy is the biggest sought after feature of watch and this offers in the best way. The use of the Blue Angels name and logo is with the permission, but not endorsement, of the U.S. Navy. Blue color represents blue angel and at the same time breaks the monotony of usual dial which sport silver or black color. So be different and fly high!